Ready to choose your theme? Let’s go! Free theme or premium theme: Which should you use? There are excellent free WordPress themes out there, as well as excellent premium (paid) themes. Which is better for your biz? Features: Premium themes usually have more features. These include things like image galleries, portfolio sections, popups, pricing tables, and lots of styles for call-to-action buttons and other page elements that are useful for your biz. Support: Most of the time, you’ll get better tech support from a premium provider. It’s in their best interest to have happy customers! Updates: Since they’re being paid for their work, premium theme developers are more likely to update their themes to fix bugs, plug security holes, and keep them compatible with the latest WordPress version. Originality: Many free themes are downloaded hundreds of thousands of times. If you use a premium theme, there’s less chance that your site will look exactly like someone else’s! What features do you need from your theme? When choosing your theme, it’s worth taking some time to think about the features you might need for your site — both now and in the future. Accordions (collapsible sections of content in the page). Many themes, such as those from WPZOOM, let you easily add lots of different elements to your page. Often the theme adds buttons to your WordPress editor’s toolbar to make it easier to add these shortcodes. Alternatively, if your theme includes a page builder (see below) then you can usually insert these features using the builder. Although you can add features later via plugins, it will save you time if they’re built into the theme you buy. So try to make sure your theme includes the features you need! The standard WordPress editor lets you add formatted text, images and videos to your page content. However, some themes come with integrated page builders. These add a big button to your page (or post) editor in WordPress. When you click the button, you switch from the regular WordPress editor to a drag-and-drop editor that lets you totally customise the look of your page. You can add things like buttons, image sliders, testimonial boxes, tabs, portfolio boxes, image carousels, and other rich content elements. Each element has options that let you adjust the way the element looks and behaves. For example, you can use a colour picker to change a button’s colour, or use a drop-down menu to change the layout of the image and quote inside a testimonial box. The Divi Builder from Elegant Themes makes it easy to add and edit all sorts of page elements — no coding required! Page builders also let you change a page’s layout by dividing everything into rows and columns. You can drag elements between rows and columns until you get the layout you like. Can be slow to work with: Although it’s easier for a non-techie to build and tweak custom page designs and layouts this way, it can be slower than coding them by hand. You — or your developer — can often adjust a page layout more quickly using CSS than you could by manually clicking lots of options and sub-options in the builder. This is especially true if you want to make a change across many pages at once. Limited flexibility: Although page builders give you a lot of different elements to play with — as well as tons of styling options — you’re still limited by the options they give you, unless you want to get your hands dirty with coding. Lock-in: Most page builders add tons of builder-specific shortcodes to the content of each page or blog post where you use it. This “shortcode pollution” can make it fiddly to move your site to a different theme or page builder in the future — especially if you’ve created a large number of content-heavy pages with the builder. Can be developer-unfriendly: If you hire a developer to make some code changes to your site that you’ve built with a page builder, they may have a harder job than if you’d used a regular theme without a builder. This might end up costing you more money in the long run. How much customisation do you need? It’s also worth thinking about how much you’ll want to tweak your chosen theme to give it a unique look for your biz. Pretty much all WordPress themes let you customise basic elements like the header image (logo) and the colours of things like headings, body text, and links. You do this through the Appearance > Customize option in your WordPress admin. Some themes, though, go a lot further and give you tons of customisation options. For example, they let you switch between several different page header and footer layouts, or completely customise the look of your buttons and other in-page elements, just by clicking a few buttons in the WordPress admin. Some themes, like Avada from ThemeFusion, let you choose from a range of header layouts, then customise them to your heart’s content. It might seem that “more equals better” when it comes to customisation, but there are advantages to choosing themes with fewer customisation options. For instance, you won’t have to spend ages learning how all the theme options work, and there’s less chance of something breaking! What’s more, if you love the look of the theme out of the box then you probably won’t need to customise it too much. If you do want to do a lot of tweaking then you or your developer can always edit the theme’s CSS by hand. When you’ve found a theme you’re keen on, it’s a good idea to run through this checklist to make sure the theme’s up to scratch. Made by a reputable theme developer? While not essential, if your theme is made by a well-known developer with a good reputation then there’s a good chance it’s a decent theme. Well supported? Does the theme come with good technical support options? These might include a support forum, online chat, email support, and a knowledge base containing tutorials and FAQs. Mobile-friendly? Make sure the theme looks good and works well on desktop browsers, tablets, and mobile phones. The page layout should be responsive, which means it automatically adapts to the size of screen that it’s viewed on. Frequently updated? The developer should be updating the theme often so that it’s compatible with the latest version of WordPress, as well as fixing any bugs and security holes. Compatible with all popular browsers? The last thing you want is for your site to look crappy — or even worse, not work at all — in a browser that many of your visitors use! Make sure the developer guarantees compatibility with at least Chrome, Firefox, Safari, Internet Explorer, Microsoft Edge, and Opera across PC, Mac and mobile platforms. Compatible with plugins you want to use? Most themes tend to work fine with most plugins. However, if you have specific plugins that you need to use — for example, WooCommerce for your online store — then make sure the theme’s compatible. Free of security holes? Nothing is worse than installing a new theme, only to have your site hacked the next day! It’s worth checking reviews of the theme to make sure it hasn’t resulted in hacked sites. You can also search for the theme on the WPScan Vulnerability Database to see if security holes have been reported. If you already have a copy of the theme’s zip file, you can also try uploading it to Theme Check. This free service analyses a theme and gives it a score based on how many potential security holes it found. Bear in mind that it’s very strict: if it reports a lot of issues then they may not necessarily be major security holes. But check with the theme developer to make sure! Now you know what you need from your WordPress theme, and what to look for when choosing it. But how do you actually find some top-quality themes? Here’s a good place to start. It’s a list of five of the best theme developers out there (in no particular order — they’re all great). If you pick a theme from one of these guys, you probably won’t go far wrong! StudioPress makes the popular Genesis theme framework, which is used by hundreds of theme developers to build high-quality WordPress themes (known as child themes). To use a Genesis child theme, you install both the Genesis framework and the child theme on your site. Then you activate the child theme. The company also sells its own child themes based on the Genesis framework. StudioPress (and third party developers) make clean, developer-friendly WordPress themes based on the popular Genesis framework. StudioPress themes and the Genesis framework are loved by developers, because they make it easy for them to build and tweak themes. The themes made by StudioPress have a clean look, great typography, and good security. They’re also mobile-friendly and great for SEO. Support-wise, the Genesis framework — as well as every StudioPress child theme — comes with documentation explaining how to set up the theme, import the demo content, and work with the built-in widgets, shortcodes, and CSS. There are also developer docs that make it easy for you — or your techie person — to create or tweak Genesis child themes, and a ticketing system should you need to contact StudioPress for help. StudioPress themes don’t come with a ton of features; there’s no page builder, and generally you just get basic shortcodes for things like the date, time, and author of the currently-displayed blog post. You’ll need some coding knowledge (or access to a friendly web developer) if you want to make major changes to the theme’s look. Elegant Themes is mainly known for Divi, its “kitchen sink” theme that comes with a ton of features and options to let you create almost any site design. You can easily change things like text colours, sizes and fonts — there are around 100 Google fonts to choose from — as well as select from a range of different header and footer styles that can radically alter your site’s look and feel. The star of the show, though, is the Divi Builder, a visual page builder built into the Divi theme (also available as a separate plugin). It lets you easily add and tweak a wide variety of page elements, from accordions and buttons through to countdown timers, portfolios, image galleries, testimonials and more. You can also customise your page layouts by adding rows and columns and dragging elements between them. 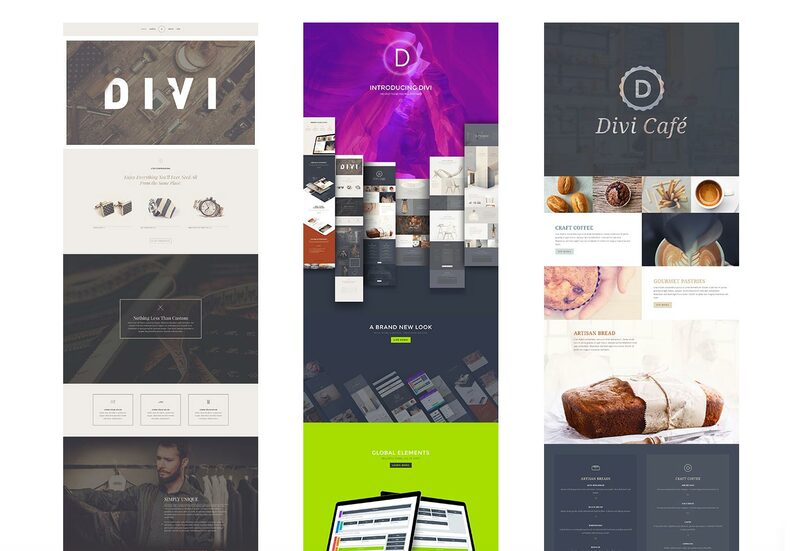 Thanks to its customisation options — as well as its visual page builder — the Divi theme lets you create a huge range of page layouts and styles. Divi comes with over 20 layout templates to get you started, and there are plenty of Divi child themes available if you want to get a head start. Elegant Themes offers tech support for Divi (and its other themes) with detailed documentation and video tutorials, as well as an online support ticket system and an individual help forum for each theme. Tons of useful shortcodes for adding page elements like buttons, icons, info boxes, tabs, columns, and slideshows. It also adds a handy Shortcode Generator button to the WordPress editor so you don’t have to remember all the codes. A 1-click demo content install feature, which loads the theme’s demo content into your site at the click of a button. A theme options panel that makes it easy to change many global theme settings, such as the colours and page layout. It’s worth pointing out that the ZOOM Framework doesn’t work like StudioPress’s Genesis framework. Rather than being a theme in its own right, the ZOOM Framework is integrated into the theme that you purchase — there’s no child theme to install. WPZOOM offers a range of great-looking businessy themes based on their feature-rich framework. WPZOOM’s themes don’t come with a page builder. However, there are many business-oriented themes so you’re likely to find a design that fits your needs, and the shortcodes let you create your own column-based layouts. The Presence theme in particular has tons of customisation options, so you can get the layout you want. Support options include a knowledge base and a support desk, as well as setup docs for each theme. ThemeFusion is unusual in that it produces just one theme: Avada. Like Divi, Avada is a “kitchen sink” theme that lets you create practically any design you want. This is thanks to its huge range of customisation options, as well as an excellent page builder plugin (called Fusion Builder) that comes with the theme. Pretty much every page element you could want, which you can insert using Fusion Builder or shortcodes. These include buttons, image galleries, checklists, columns, counters, FAQ sections, icons, Google Maps, popups, pricing tables, and over 500 Google fonts. 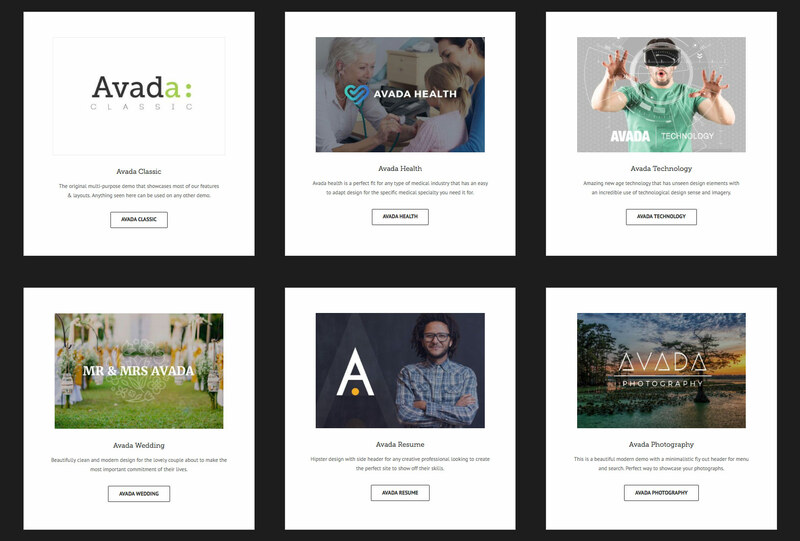 Over 20 complete demo site designs — created entirely using Avada’s options — with a 1-click installer, so you can get a complete theme up and running instantly. 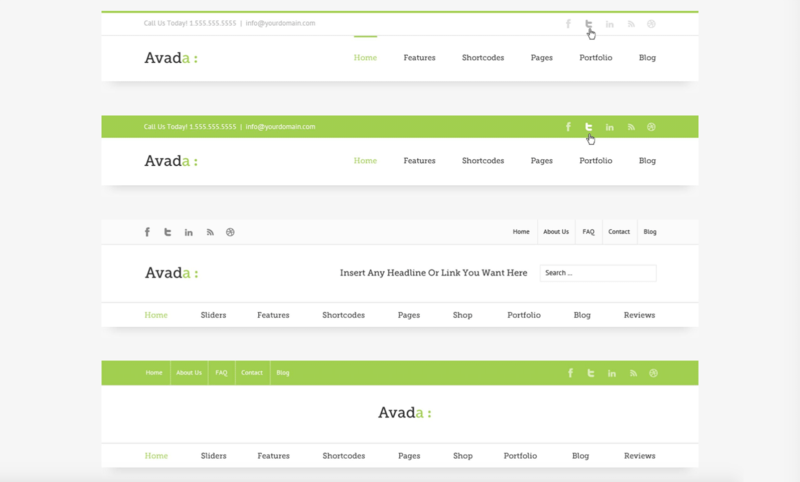 ThemeFusion’s Avada theme is super-powerful and flexible. It comes with over 20 demo designs, all built using Avada’s customisation options. Check out the live demo to see all the features of Avada. If you get stuck, ThemeFusion offers documentation, a knowledge base, and a range of tutorial videos. You can also ask for help by submitting a support ticket. 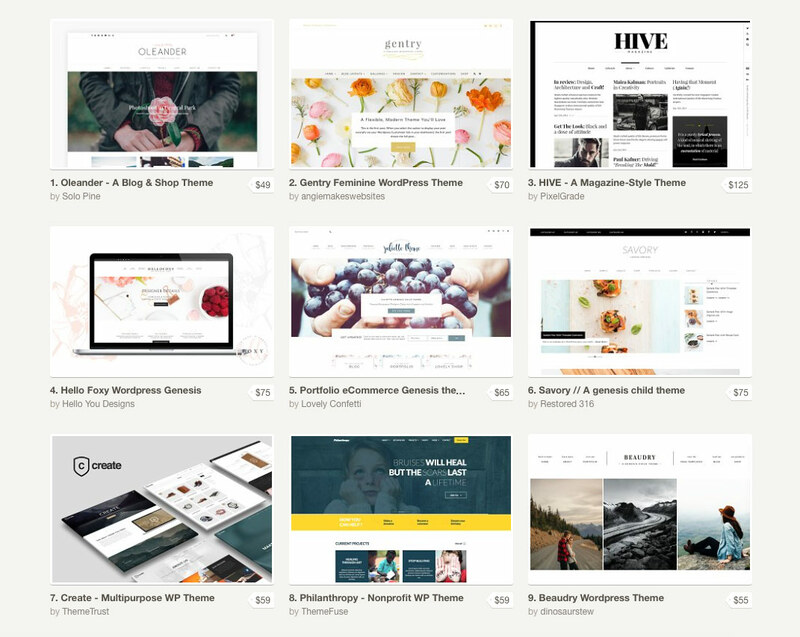 Organic Themes offers no-nonsense, beautiful themes. 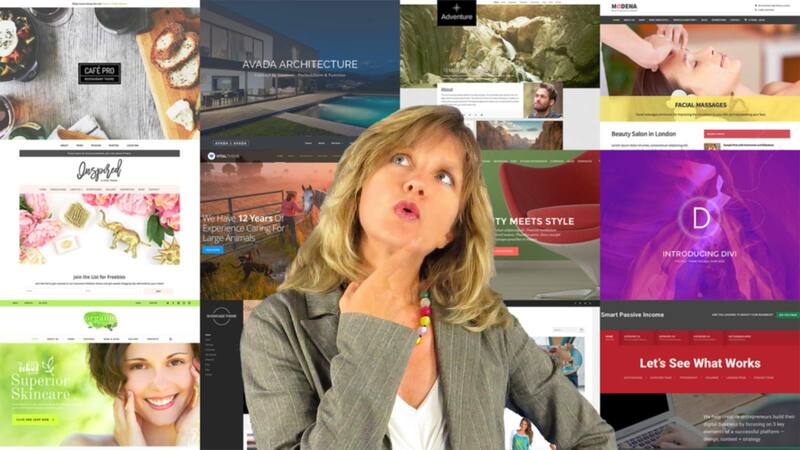 You won’t find fancy page builders, complex theme frameworks or bewildering theme options here. 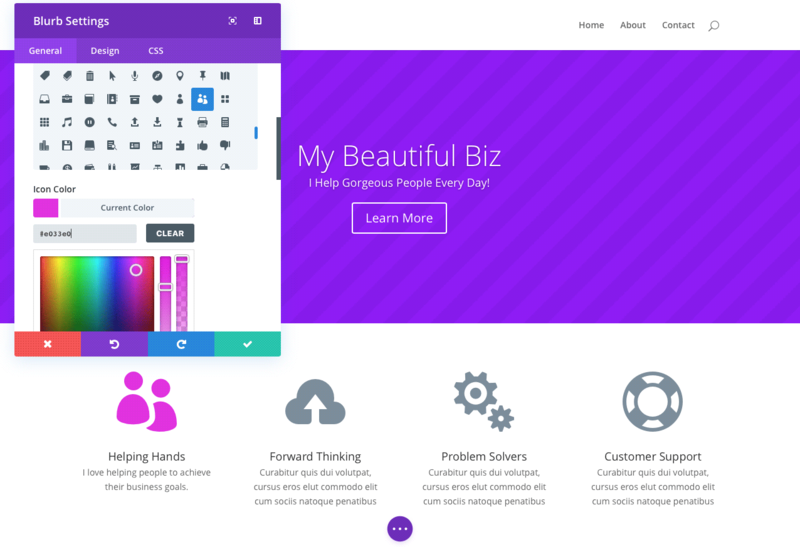 What you will find is a really nice selection of clean-looking themes targeted towards a wide range of business uses. These straightforward themes are easy to set up, very well coded… and look fantastic. Check out the lovely Luxury theme geared towards high-end products and services, as well as the popular, minimalist Structure theme, which is a great starting point for any site. The WordPress themes from Organic Themes are clean, well coded, and beautiful. While there’s no page builder, most themes include a range of shortcodes for things like buttons, icons, galleries, and tabs. Currently there are four free themes and 29 paid themes available. All the paid themes are WooCommerce-compatible, making it easy to set up your online store. Interestingly, Organic Themes also offers WordPress hosting if you use one of their themes. It’s a nice way to get a complete WordPress site — with theme — up and running super-quickly. As well as the theme developers listed above, you can scour theme marketplaces for premium WordPress themes. ThemeForest is an enormous and very popular theme marketplace, with thousands of themes available. They review every theme before it goes on sale, which helps to ensure that the themes are decent. The WordPress Theme Directory has a big list of recommended premium theme developers. MOJO Marketplace is another well-known marketplace for digital goods, and it contains a good WordPress themes section. 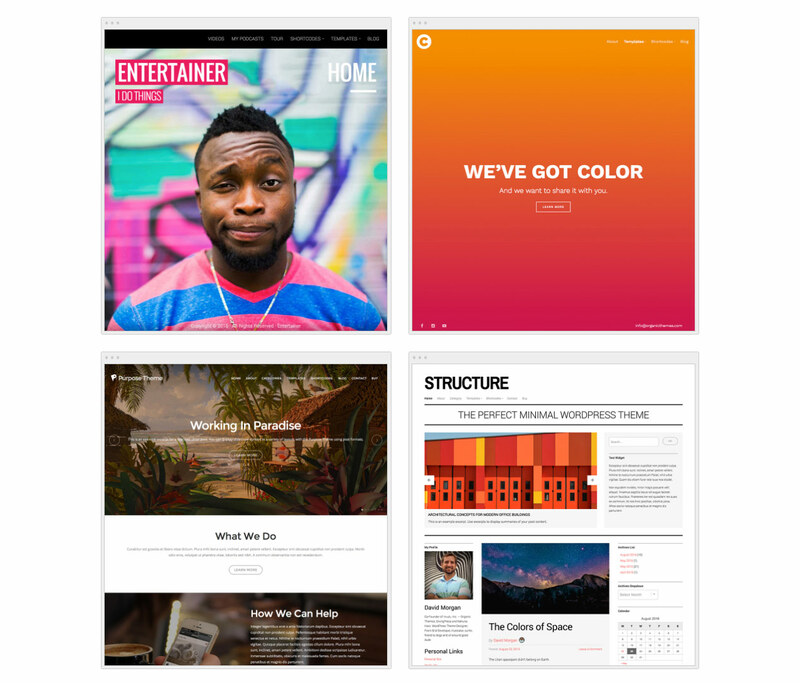 As with ThemeForest, themes are reviewed by the MOJO staff before they’re allowed to go on sale. Creative Market sells digital design work from creatives all around the world — a “digital Etsy”, if you will. This includes a few thousand beautiful WordPress themes, many of which are Genesis child themes (see StudioPress earlier in this article). The themes don’t have user reviews as such, but shoppers can “like” a theme and recommend a particular seller. Creative Market also vets new sellers to make sure they offer good-quality stuff. 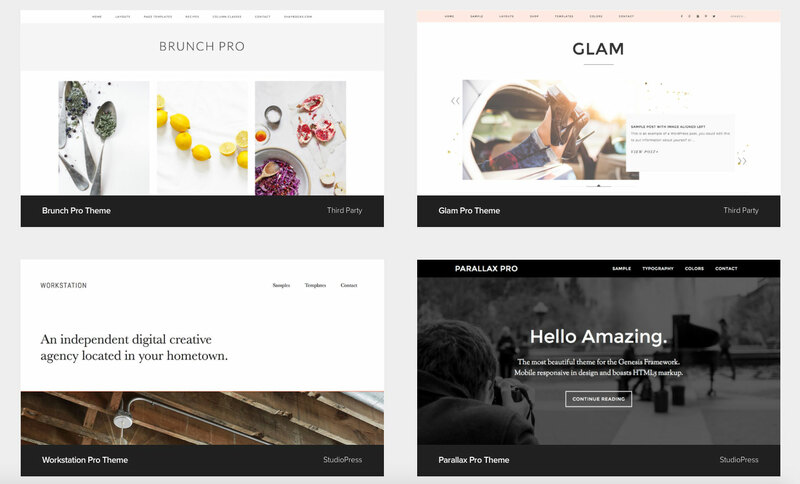 Creative Market offers a range of attractive WordPress themes from a variety of designers. These marketplaces offer quality themes, but they can still be a bit hit-and-miss. Make sure you check out the user reviews for each theme to get an idea of how good the theme is in practice. Choose your theme with confidence! Choosing the right WordPress theme for your biz can seem overwhelming. However, with the tips and suggestions in this article you’ll be able to pick a decent, reputable theme that fits your needs. So grab a coffee, write down what you need from your theme, and start checking out a few of the themes and developers in the article. Before you know it, you’ll have picked the perfect theme for your WordPress site! Do you need help with choosing a theme? Or if you’ve already chosen one, which did you choose, and why? I’d love to hear how you’re getting on, so please let me know in the comments below! Great post Matt. 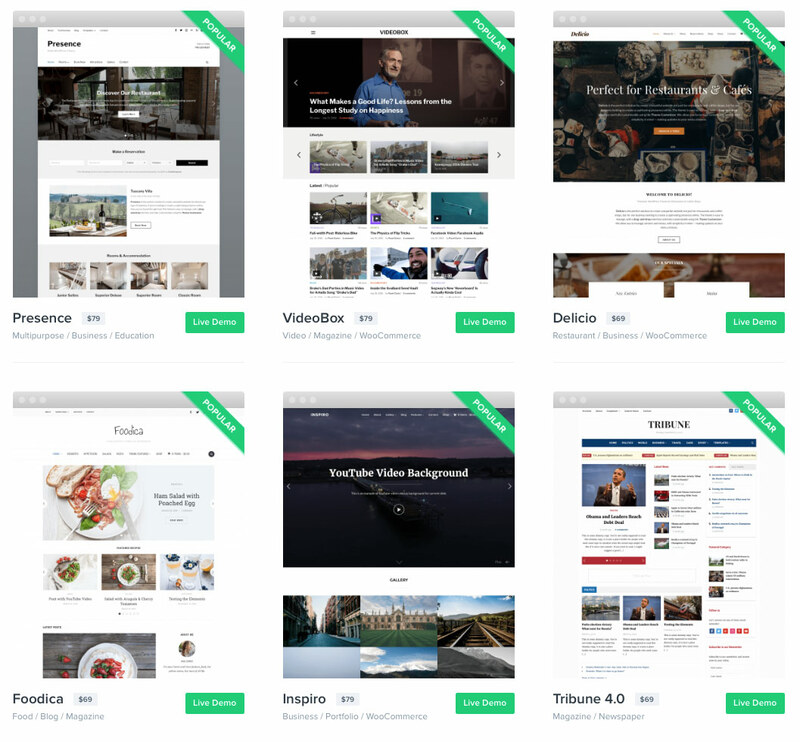 I have a bunch of themeforest themes purchased, that includes Avada. Also have Divi/Elegant Themes, and Genesis. Based on what I see with non-technical, non-developer customers – Genesis-based themes tend to be fast out of the box. BUT, no drag and drop like that of Divi and Avada. And I came across a WordPress theme framework called “Beans”. Still learning it, and it seems more powerful than Genesis. The problem with Avada, Divi, and etc, is that they are easily abused by the typical user – it’s too easy to load up your page with all kinds of stuff that will slow it down. But ofcourse, if you’re a developer you can modify almost any theme, to even make it faster. Thanks for your comment Cammy. 🙂 I agree, there are pluses and minuses to both Genesis themes and the themes that use page builders! Is this Beans? It looks good!